Miranda Moore QC, prosecuting, told the court that the investigation agency "carried out bog standard or the usual work a detective agency does" but also "had a number of very lucrative sidelines". These included organising "hacking into people's computers and bugging people's telephones", which were both illegal in Britain, she said. The court was told the agency's alleged illegal activities brought in tens of thousands of pounds from some clients. Documents found by police during their investigation showed how the firm charged up to £7,000 a month for phone bugging or hacking into a computer, and £2,000 to obtain details about a bank account, Ms Moore said. She told the court that Mr Mellon, a multi-millionaire from Belgravia, central London, used the services of AIS to snoop on his wife Tamara during divorce proceedings because he wanted to find out information he could not get through the courts. "But it was not by tapping into her telephone, it was by hacking or trying to hack into her emails to see what was going on," she said. 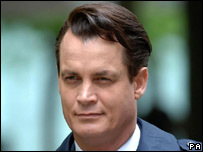 The jury of five woman and seven men was told that AIS, at the request of Mr Mellon, used a "Trojan" computer virus allegedly created by American-based IT specialist Marc Caron. One of the viruses, which are hidden inside emails and attack a computer when opened, was sent to Mrs Mellon, jurors heard. Mrs Mellon opened it because it "purported to show what her husband was up to", said Ms Moore. The Trojan then recorded "every keystroke that was made", she said, including such things as bank account numbers and passwords. "They didn't take any money. They didn't steal anything, but from time to time they had a little snoop on behalf of their clients," Ms Moore said. "There was a general agreement that if clients wanted that sort of information, they would say we offer this service - Hackers Are Us." Mr Mellon denies conspiring to cause unauthorised modification of computer material between 1 July 2004 and 4 February 2005. In the dock with Mr Mellon are ex-policemen Scott Gelsthorpe, 32, from Kettering, Northamptonshire, who helped run AIS and David Carroll, 58, of Highgate, north London, who also played a role in AIS. Mr Carroll's computer-expert son Daniel Carroll, 36, from Westminster, London, who ran his own company above the agency's premises and Maurice Kennedy, 58, of Barnet, north London, another customer accused of using the agency's alleged illegal services, are also on trial. They variously deny 15 counts of conspiracy alleging fraud, the unauthorised modification of computer material, the unlawful interception of computer material, and criminal damage. Prosecutors said 30 people were arrested in connection with the police investigation into the activities of AIS. The court was told that apart from the five on trial, a number of had been dealt with, others had pleaded guilty and were awaiting sentence and some were still to stand trial. There had been no further action against the rest.